We recently announced that we will no longer be updating 2D Apple Games by Tutorials, since most game developers these days prefer to use modern game engines such as Unity or Unreal Engine. However, 2D Apple Games by Tutorials has a very special place in my heart, so I wanted to take this opportunity to give a little post-mortem of the history of the book. I can’t really talk about 2D Apple Games by Tutorials without at least mentioning Cocos2D — after all, that’s a large reason for how this site first got started! For those of you who don’t know, Cocos2D was an extremely popular game engine by Ricardo Quesada that came out when the iOS SDK was first released. The API was very well designed, and it was a lot easier than the main alternative (writing the game completely in OpenGL)! So back in 2009, I was first getting started with iOS development and used Cocos2D to create my first iOS game — Math Ninja. I found it a bit challenging to learn as there wasn’t a ton of documentation, so I started writing some tutorials on the subject. 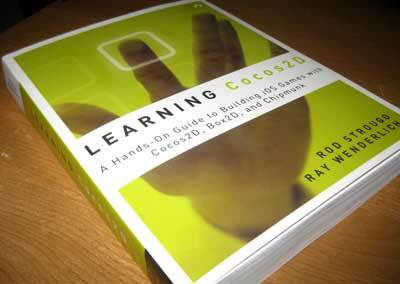 Eventually, Rod Strougo contacted me to see if I’d like to join him on writing Learning Cocos2D, a book for beginners to Cocos2D. We had a great time writing the book, and it was very well received. After we launched the book, Rod and I would travel around the country giving a Cocos2D workshop titled Cocos2D via Mini-Games. Some of the games we developed for this workshop became inspiration for our SpriteKit book later on! I also met some awesome people at these workshops, such as Sean Berry and Charlie Fulton. But everything changed in 2013, when Apple introduced iOS 7 — and a new game technology called SpriteKit. Not that I was complaining — I loved the Cocos2D API (especially its easy-to-use action system), so I loved SpriteKit by extension. As a small site, we couldn’t afford to cover both SpriteKit and Cocos2D, so we decided to go where our readers preferred — and that was SpriteKit. I got to work with a dream team of co-authors, editors and artists, including Mike Berg, Mike Daley, Jake Gundersen, Ali Hafizji, Matthijs Hollemans, Chris LaPollo, Rod Strougo, and Marin Todorov. We were all super passionate about the book, and really put in all we had to make the best possible book we could! We even wrote our own helper library for the book called SKTUtils to help make working with SpriteKit easier and more fun. I remember that we had the book all done and just needed to perform one final edit pass of all chapters to make sure they worked with the latest Xcode GM. Tech editor Chris LaPollo and I were up all night on IRC, chatting back and forth as he’d do one final check, and I’d do my pass as well. By the end of the night, we were exhausted, but we got it done! The book was a smash success, selling over $100K in the first year alone. And even better — we got tons of emails from people who used the book to get started with game development and release their first game on the App Store! The first version of the book was released in 2013 and was written in Objective-C. Yes, Swift wasn’t even released yet! 2014 — iOS Games by Tutorials Second Edition: This is the year Swift was released, so we ported the entire book to Swift! We also included some new chapters on porting games to OS X. 2015 — 2D iOS & tvOS Games by Tutorials: Some big changes came this year, with the release of GameplayKit and tvOS. So we did a massive overhaul of the book, including three new games: Drop Charge, Dino Defense, and Delver. 2016 — 2D Apple Games by Tutorials, Second Edition: This is the year watchOS came out, so we added coverage for that and updated the title accordingly. We also added another new game — Zombie Piranhas! 2017 — 2D Apple Games by Tutorials, Third Edition: This is the year ARKit came out, so we showed how you can integrate SpriteKit with your AR apps. With the exception of the 2015 release, which was a special case, all of these were free updates for existing digital version customers. Thanks to everyone who purchased the book and made this all possible! The team and I have truly enjoyed working on 2D Apple Games by Tutorials (and its spiritual predecessor, Learning Cocos2D) over the years. In many ways, it feels like the end of an era. But, as they say, sometimes you need to clear out the old to make way for the new. The new raywenderlich.com has two brand new sections with tons of free gaming tutorials – one for Unity Tutorials, and one for Unreal Engine Tutorials. Our book Unity Games by Tutorials teaches you how to get started with Unity — the most popular gaming engine out there — by making five mini-games from scratch, including a twin-stick shooter, a first-person shooter, a tower defense game (with VR support!) and a 2D platformer. Our new Beat ’em Up Game Starter Kit shows you how to create your own side-scrolling beat ’em up game in the style of such arcade classics as Double Dragon, Teenage Mutant Ninja Turtles, Golden Axe and Streets of Rage — using Unity! Our book Metal by Tutorials introduces you to graphics programming in Metal — Apple’s framework for programming on the GPU. You’ll build your own game engine in Metal where you can create 3D scenes and build your own 3D games. Thanks again to everyone who purchased our SpriteKit and Cocso2D tutorials, and we look forward to creating many more gaming tutorials for you in the future!